Feb. 15, 2011, 11 a.m.
By Joshua Benton @jbenton Feb. 15, 2011, 11 a.m.
— Publishers who sell subscriptions to content on Apple devices must make that subscription available for purchase within their apps — a path that promises easy, one-click purchases for users but that also gives Apple a 30 percent cut of the payment. — Publishers can still sell access to subscriptions outside the app — say, by taking a credit-card payment on their website. But the cost can be no lower than the price offered inside the app, and publishers are responsible for setting up their own authentication system for those subscribers. At first glance, this is exactly what a lot of publishers were fearing: Apple setting itself up as a toll-taker on news orgs’ road to a new business model. (Excuse the metaphor.) For publishers who had been counting on a new rush of tablet revenue to support a lagging print model, it’s disappointing to learn that, in exchange for the convenience of a “Buy” button in their iPad app, they’ll have to give up 30 percent of the revenue it generates. We’ll have to see how it plays out in the coming months, but first, here are four quick reactions to what the latest word from Cupertino means for news outlets. That means news organizations will be incentivized to convert customers they already have relationships with — a.k.a. print subscribers — into tablet-only or tablet-also readers. If you’re a newspaper and you can convince your 20-year subscriber to pay a little extra for a tablet subscription, you get to keep that marginal revenue because you “brought” that subscriber to the app and processed her billing outside Apple’s systems. In the long run, though, such a strategy could hurt newspapers who already have disproportionately older audiences. Converting 20-year subscribers to a new platform isn’t as valuable as converting non-readers into tablet readers. Part of the appeal of tablets and smartphones is that they promise to put newspapers in front of a younger audience that, frankly, hasn’t picked up a print paper in years, or ever. For those people — people who download an app, like what they see, and decide to subscribe — Apple will take its cut. It’s a perverse incentive for publishers. The big question here is what this policy will mean for bundling. Lots of publishers are selling bundled packages — pay one price and get print, web, iPhone, iPad, and whatever-else access. Apple’s press release is unclear on how those would be handled. Lots of publishers get away with “charging” an extra penny for access to an e-edition no one uses. Will they be able to get away with bundling tablet access with print outside an app? Or will they have to funnel their print revenues through Apple too if they want to sell as a package? Giving up 30 percent of tablet revenue is one thing; giving up 30 percent of print subscription revenue is suicide. 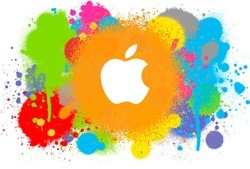 It’s been rumored that the next iPhone, due this summer, would include near field communications, or NFC, capability. That’s similar to the technology that lets you tap your credit card instead of swiping it at some stores, and it could, in effect, turn your Apple device into something like a credit/debit card that lets you pay for physical items in physical locations, not just a Mighty Eagle in Angry Birds. If that’s in the iPhone’s future, it’s clear Apple would need to create a different pricing tier for buying via NFC. Taking a 30 percent cut isn’t tenable if you’re buying a laptop or a week’s worth of groceries. Store owners will need to be convinced to embrace NFC payments, and they’ll only do so if they can do so at a cost that’s competitive (for them) with credit and debit cards. So the assumption’s been that Apple would, in a few months, debut a separate tier of pricing for Apple’s share of those purchases. And it makes sense that, as Apple’s universe grows, a one-size-fits-all pricing model isn’t going to work. What made (grudging) sense to iPhone developers three years ago isn’t going to make sense in every other market. Selling subscriptions to content — content generally produced at substantial cost in a non-digital context, in the case of most newspapers and magazines — would seem to be a logical place to offer a smaller cut in an attempt get as many news orgs headed to iPads as possible. But that’s not what Apple’s chosen. But the vast majority of the world still lacks a tablet, of course, and there’s still a lot of selling to be done. It will be interesting to see whether Apple’s competitors will see an opportunity to get news outlets — which still have major marketing power — to shift their favor in some other tablet’s direction. RIM and HP both have proprietary operating systems on their tablets that could offer better deals in stores; the Android world remains something of a free-for-all, with rival stores for apps and what seems to be a real difficulty getting anyone to pay for anything. But if a rival OS could pitch a great deal to news orgs, the field is still fresh enough that some of them might be willing to promote the hell out of it as their preferred tablet choice. For a market where Apple takes up a lot of the oxygen, that promise of a promotion platform could be appealing. One thing absent from today’s announcement: any requirement that a news org selling subscriptions to an iPad app disable or charge for access to its website on iPads. Our own Ken Doctor predicted that would be part of the new Apple model, intending to funnel all tablet users through the app rather than relying on a still-free alternative a few taps away in Safari. I think not going there is smart — too many news organizations are still betting on a mixture of free and paid for their digital strategy to tie web and app access together so closely. If we lived in a world where everyone was committed to Times (UK)-style paywalls, it might make sense. But there’s still a lot of nuance to be figured out on where to charge and where to give away, and any rule from Apple governing such a big part of the mobile web would stifle the experimentation I hope we’re finally going to see in 2011. Finally, that’s one other question left unanswered by Apple’s release: How much leeway will publishers have to balance free and paid within an app. Outside the news world, app developers have complained that Apple doesn’t allow free trials for apps — you can’t download an app, try it out for seven days, then decide whether or not to pay. Developers complain that makes it harder to sell expensive apps, which people will rightfully want to try out before spending $50. How will that idea carry over to publishers? Will someone be able to download an app and get the first three issues of a magazine free before getting pitched on a subscription? Will someone trying a metered model, like The New York Times, be able to let someone read 10 articles a month before hitting the paywall? The in-app purchasing model Apple’s using for subscription would seem to allow some leeway, but we’ll have to see how it works in the real world. POSTED Feb. 15, 2011, 11 a.m.
Benton, Joshua. "What Apple’s new subscription policy means for news: new rules, new incentives, new complaints." Nieman Journalism Lab. Nieman Foundation for Journalism at Harvard, 15 Feb. 2011. Web. 18 Apr. 2019. Benton, Joshua. "What Apple’s new subscription policy means for news: new rules, new incentives, new complaints." Nieman Journalism Lab. Last modified February 15, 2011. Accessed April 18, 2019. https://www.niemanlab.org/2011/02/what-apples-new-subscription-policy-means-for-news-new-rules-new-incentives-new-complaints/.